Overnight Friday Night: Rain showers on Nantucket, then Cape/Islands light snow/rain combo. Light accumulation. Lows around 30. Light SW wind. Saturday: Snow expands northwest during the morning to midday, continuing into the night. Plowable snowfall expected. Highs in the 30s. Northeast wind increasing 5-15 mph G35+ at the coast. Sunday: System departs with a few lingering flurries in the morning hours. Brisk breeze with a west wind at 10-20 mph. 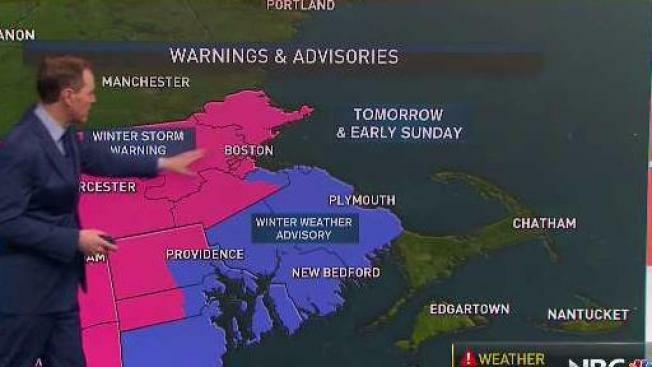 Snow lovers rejoice – a winter storm is taking aim at New England. The entire six-state region enjoys a quiet Friday to mount the plow, pick up ice melt and make sure the snow toys are ready to go… and the first impact for New England will actually be in the form of raindrops on Nantucket around or shortly after dinnertime. The National Weather Service has already issued winter storm warnings and watches for many parts of New England. The Massachusetts Department of Transportation said it is already pre-treating roadways and planning deployments of snowplows, spreaders and maintenance equipment. They asked residents to minimize travel if at all possible, and urged anyone who must go out to drive slowly, allow extra time to reach their destinations and avoid crowding the plows. Showers will spread north through the Vineyard and Cape Cod late Friday night, changing to light snow on the Cape overnight and accumulating a coating to a solid inch from the Middle to Upper Cape by Saturday morning. Snow will expand northwest through the rest of Southern New England during the mid- to late-morning, and then spread farther north during the afternoon, with the heaviest and most widespread snow falling during the afternoon into evening. Snow will wind down for most of us overnight Saturday after leaving a general 3 to 6 inches inland and 1 to 3 inches at the coast, with slightly lower amounts in far western New England, removed from significant moisture, and along the immediate coast, subject to an influence from ocean temperatures still near 50 degrees. Inside of Interstate 95, the snow will be fairly heavy and wet in consistency, and even slushy and sloppy near the immediate coast where mixing and changing to rain will occur, while farther inland the snow consistency will be lighter. Sunday brings sun and clouds after any lingering snow departs from the North Country, particularly in Maine, then Monday marks another quiet day before the next storm center arrives. Snow showers may redevelop as soon as Monday night, with a rain and snow combo a possibility yet again on Tuesday, ahead of a shot of colder air for the end of next week in the exclusive Early Warning Weather 10-day forecast.